Oscillator Pak - Sampler Synth Elements [Freeware], Other Virtual Synth from Retro Sampling. 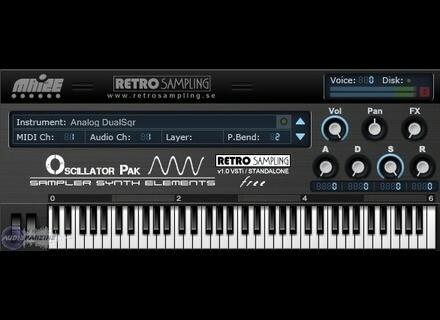 Retro Sampling has announced the release of Oscillator Pak - Sampler Synth Elements, a Maize Sampler-based waveform ROMpler containing a selection of waveforms for alternative synth programming. Besides the Windows VSTi/Stand-alone version there is also a selection of patches/banks for the most common sample formats, including: WAVE / HALion / Kontakt / NN19 / NNXT / Refill / Giga / DS404 / CMPlay / SoundFont / EXS24 / DirectWave / HALion HSB & Kontakt Monolith (For more format information check the included PDF). Oscillator Pak - Sampler Synth Elements is available as a free 170 MB download. NashNET Updates reViSiT Pro NashNET has announced that reViSiT Pro has been updated to v1.00.4 and it is now available to "experiment" participants. SKnote Releases KickHaas SKnote has announced KickHaas, a new VST effect plug-in for Windows. Five 12 Updates Numerology 2 Five12 has announced the release of Numerology v2.0.1, which incorporates fixes and improvements to this modular sequencing software.